HISTORY. Limerick. ADARE. Ruins and Headstones. Ecclesiastical History. 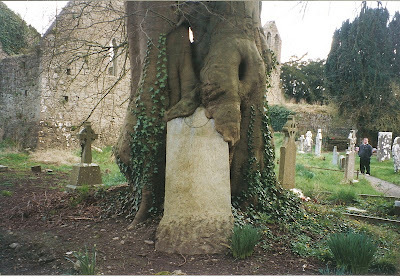 Tree 10; Gravestone 2. Theology vs. reality. Reality wins. Daniel Widing at graveyard, Adare, Ireland. Where the tree wins. Franciscan Friary, ruin in middle of golf course. For earlier era Timeline Pre-1150, see From Book of Kells to Synod of Kells. We were here on our return to Shannon airport, but include it with the rest of Limerick, where we began. Is this so: Time always wins. Humans who pit themselves against Nature and The Trees have a heavy lift. 2. Adare as part of the Roman Christian Gregorian Reforms, the era after 1100 AD or so. Ireland's ecclesiastical ruins may look alike, but their eras, and what they signify, differ: Christianity was not all of one cloth. Irish engaged Christianity their way first, before Rome came along after its split with the Eastern Christians, the Orthodox. Irish Christianity, think St. Patrick, St. Finnian. Their examples led to the monastic, contemplative, individualistic, creative phase to, say, 1100. With Gregorian Reforms on the Continent; and the jurisdiction of Rome being asserted with its administrations and armies and Holy Roman Emperors, enforcements and regimentation became more important. And there was no longer choice. That seems to be broadly true. The 11th Century Gregorian Reforms turned the face of Christianity from withdrawing from the world, the deeply meditative, the deeply spiritual ascetic; to a new philosophy. Get out there and change the world; or, in the alternative, become a monk and totally live within the monastery, no or little contact with the outside world; and only with strict permissions and limits. "The Gregorian reform encourages the practice of Christian warfare in the pursuit of providing 'right order in the world' and establishes religious enthusiasm in all of Christendom." See http://usna.edu/Users/history/abels/hh315/timeline%20gregorian%20reform.htm, Timeline entry at 1073 AD. So what? What difference does that make to Ireland, and this friary? It makes a difference because the Pope's increasing militance and crusades and moneyraising and identity forging on the Continent led directly to the invasion of the Anglo Normans in Ireland, and they never left. Look back, as you think of the tree of the papacy overcoming over time even the very stones that leaned on it for support. This begins with the 1100's; needed is a timeline from far earlier, from St. Patrick in the 400's. Pope Adrian IV, in 1155, issued a Bull authorizing King Henry of England to invade Ireland to shape it up according to Roman Church (HRE) standards. Why? 2. But Henry had been himself petitioned by one Dermot, a king in Ireland, for help to get his lands back, from those who deposed him, after his affair with a lovely lady someone else's wife, is that so? So, invasion authorized, an instigating event was very human indeed, it fit the Pope and the English King to indulge, and so they did. What a change, for Christianity and the world because the new Christianity was a totally different entity, as a centralized, power institution. Irish Christianity had been decentralized, its monasteries contemplative even if they did compete with each other and engage in raiding in early years. See it and comment at http://historymedren.about.com/gi/o.htm?zi=1/XJ&zTi=1&sdn=historymedren&cdn=education&tm=15&gps=209_11_1366_564&f=00&tt=14&bt=0&bts=0&zu=http%3A//www.yale.edu/lawweb/avalon/medieval/bullad.htm. So, this old stone, now overwelmed, is on the grounds of a Franciscan Friary, not in the early tradition of contemplation and dedication, but built by the Earl of Kildare 1464-1466, a building that was part of the institutional sweep after the age of isolated monastic activities, see http://www.discoverireland.ie/Arts-Culture-Heritage/adare-franciscan-friary/49921. The date of the stone itself? Have to go back. Christianity never recovered from this infusion of Rome's ecclesiastical authoritarian religious zeal - enter the crusades, the Northern Crusades against the people of the north of Europe, the Middle East. Certainly no recovery for the side of Christianity that early Irish Christians and others had pursued, then who found themselves righteously invaded by papal armies and the like. 1096-1099 AD, for example. Nothing is simple. What causes what? History of the Anglo - Norman Invasion of Ireland. This step backward from religion into militance authorizing , was introduced earlier as well: permission to kill unbelievers or whoever else without penalty did not start with Adrian. a. Pope Leo IV, http://www.fordham.edu/halsall/source/leo4-ind850.aspin 850 granted the indulgence to the Franks, Pope John in 878, a few years after Charlemagne's "crusades" against the northern people of Europe, massacre at Sachsenhain in 872 est. c. Read Pope Urban - "All who die by the way, whether by land or by sea, or in battle against the pagans, shall have immediate remission of sins". See http://www.fordham.edu/halsall/source/urban2-5vers.asp. 3) under a solemn vow would be regarded by the Church as meritorious acts akin to pilgrimages and earn the participants indulgences (remission of the temporal penalties of sin)." It is time to put violence in perspective. The Vikings have been long maligned. They were not the first at all to find the vulnerability of monasteries and churches. And the Roman Christian policy of invasion and murder at home and abroad if the target does not subject himself or herself to the Pope's law, makes the Vikings look like nursery school, is that so? Does anyone care any more? Irish history, old stuff. Now all of that, representing the New Ecclesiastical Enforcement Order, is a ruin surrounded by a golf course. There is another "Trinitarian" Monastery from 1293 noted at http://www.myguideireland.com/adare-heritage-centre-and-desmond-castle-tour, the "White Abbey" because monks wore white robes; that may have signified Cistercians, see http://www.sacred-destinations.com/reference/cistercians. It later the was known as the"Black Abbey" when it became Benedictine (Augustinian?) and the monks wore black robes. Are these at this White-Black friary one and the same or different from this Franciscan Friary? Ireland's ruins have more to say than that. So much of history is lost with such brief references. FN 1 When did these large ecclesiastical Orders come to Ireland? It wasn't until 1100 AD. 841 - Vikings settle in Dublin, make alliances with some Kings; raid and settle at Wexford, Waterford, Limerick. 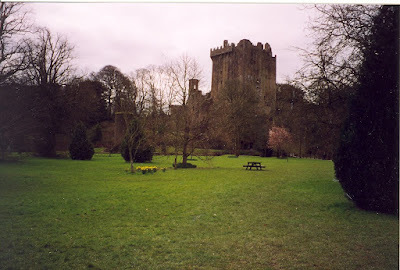 Earlier monasteries had wealth, see the raids by other monasteries and abbots and other Irish as to the earlier structures, http://www.deremilitari.org/resources/articles/fitzpatrick.htm, but nothing like the wealth that was possible for the church now through the "reforms." Read the Rule of St. Benedict at http://www.osb.org/rb/text/toc.html At what cost was that regimentation, how like political dictatorships as to individual thought? Is that so? The sensory deprivation of living in cells, minimal diet, and sleep deprivation of up to do services on rigid schedules, "rules" - today we would call the process brainwashing. Compare the Rule of St. Francis at http://www.osb.org/rb/text/toc.html. Somewhat more humana, but still not representing the pre-Augustinian reform Christianity in Ireland. Now, which Order would the Tea Party support? Simplicity--churches and other buildings unadorned and undecorated; crucifixes only of cheap, plain material--no gold and silver ornamentation. Had to be 16 to become a monk." 1113 A.D. - Cistercian Order acquires vast new properties under Bernard de Clairvaux. Number of houses grew from 5 to 393 at the time of his death in 1153. In 1143, Cistercians come to Ireland. c. 1100 - 1150 A.D. -- The Diocesan model arrives to control Irish Christianity. Irish Christianity had focused on a family-owned system, and that now begins to die out -- and with it, the unique spirituality of the Irish Church. Enter Rules, firm Creeds, regulations, inclusions, exclusions. Control. Jurisdiction by Rome. 1142 A.D. -- Cistercians come to County Meath. Now starts the influx of monastic Orders from the Continent to finish the job: Cistercians at Mellifont, County Meath, are first. 1152 A.D. -- Synod of Kells. A new diocesan form is imposed on the Irish church, with the installation of four archbishops. Hierarchy, hierarchy. And, from here on, women are barred from holding title of "bishop" and there are no more hereditary successions. Celibacy is imposed as well and required for ordination. These measures were already in effect on the Continent. As an aside "Dermot MacMurrough, King of Leinster, abducts Dervorgilla, the wife of Tiernan Ua Ruairc. Dermot and Dervorgilla are said to be lovers and the whole of Ireland learns of the affair much to Ua Ruairc's embarrassment." See Thirteen site. Pope Adrian IV is the only Pope to be from England, and he issues a "bull" allowing Henry II the King to invade Ireland to ensure Irish conformity to Roman church rule. Henry does so later, when it is more convenient as to his other wars. c. 1160s A.D. -- Back to the scandal. Dermot the abductor wants to be High King, but so might his rival Rory O'Connor. Rory wins out. He was allied with the cuckold, Ua Ruairc, and Ua Rairc seeks revenge and manages to get Dermot removed as King in Leinster. 1167 A.D. -- Dermot runs to Henry II for help, and Henry II sends an army to help Dermot get his Kingship back in Leinster. The Anglo-Normans accordingly arrive, and do not go home again. First the invitation, then the invasion. Fine excuse, blessed by the Pope. 1175 A.D. -- King Henry II sets up his son John as Lord of Ireland. The pope, Alexander III (Adrian died when?) agrees. John then ascends to the English throne and incorporates the title of Lord of Ireland into the English monarchy. Ireland comes under the authority of the English crown. And the centuries-old conflict begins. Thirteen/WNET New York see : www.thirteen.org. We came on this ruin without use of guidebook. Take back roads rather than the motorways. Find the many ruins, old churches, castles. Free to roam. No guardrails usually, just a sign saying to be careful. It is easy to find Roman Catholic sites on the later holy places, after their dominance was assured, here is one that begins with 1100 AD, http://earlychristianireland.org/index.html. Or http://www.middle-ages.org.uk/medieval-monks.htm. Our interest, however, is with the "reforms" required by the Romans when they subjugated the existing Christians in Ireland. Celtic Ireland is also easy to find, see http://www.wesleyjohnston.com/users/ireland/past/pre_norman_history/iron_age.html. St. Finnian in Meath and his monastery, Clonard. The greatest saints predate the Roman Catholic imposition. Is that so? And the greatest illumination of manuscripts similarly predating the institutional monastic movements, the Book of Kells in 800; the Lindisfarne Gospels in 700, the the Book of Durrow in 650. Irish monks of the 7th and 8th century create illuminated manuscripts which are among the greatest treasures of Celtic and early Christian art. Human interest in graveyards: It is reflected in all the words used to find them. See hundreds of words/synonyms for a graveyard, including Poe's 100- at http://www.houseofusher.net/graveyar.html. HISTORY. Saga. Normans, Strongbow, and Norse Migrations. Vikings raided, invaded and captured Irish for slaves; and raided monasteries. Note that this was not a first occurrence of attacks by somebody against the monasteries: many of the early Christian monasteries also raided each other, and Irish people themselves also raided the monasteries. Perhaps the loals did not have the same battleax-gusto, but there were raids, deaths, treasure to be had. See http://www.irelandseye.com/irish/people/settlers/vikings2.shtm. The Viking stories in Iceland offer a picture of a community with its own laws, allegiances, systems. Not "barbaric" the sense of lawless. 1. We are accustomed to thinking of the Norse as Vikings from Norway or Iceland, or Denmark. Norse generally means North. The Norwegian-Icelandic Norse headed for Scotland (including the Orkneys and the Hebrides) and Ireland (among far-ranging other parts of the world). Ireland was as a target for the Viking-Norse - Ireland first as source of booty, then a settlement destination for the Norse. Meanwhile, other waves of Norse aimed for the heart of France, up the Seine and any waterway that could be found. They made so much trouble that Paris bought them off so that they would continue up to Burgundy instead; and finally they all bought off the Vikings from their dreadful raids by giving them Normandy - land of the Northmen. Normans. So the Normans were named from the who raided France and were bought off by giving them Normandy, France. They are the ones who invaded the British Isles. And then, from there, Ireland. Danes, another group of Norse, headed for England more likely. Swedish Vikings tended to raid and invade and settle more south and East - into Northeast Europe, and Russia. So: relationships between groups include those stemming from raids, invasion, exploitation, enslavement in and this applies to Ireland's interaction with the Norse. Where a stand-off results, with neither fully conquering the other, or fending them off, see a cultural tolerance arise. Settlers settle and contribute to the community, the community grudgingly accepts, many cross-pollinate eventually, there is intermarriage. The Norse settling in Ireland as well as the rest of the British Isles, became integral parts now of that entire heritage. Try "The Timechart History of The World: 6000 Years of World History Unfolded," Third Millennium Press 2004. Scandinavia and Britannia start about 450AD. The Norse conquered - obtained Normandy, France, in 906; and the Norse conquered England a century later, in 1066. Then another branch of Northmen, not the old Vikings in raiding longboats, but by then the "Normans," stemming from Normandy, and then from England as the Anglo-Normans, invaded Ireland in 1170. Meet Richard fitz Gilbert de Clare, known as "Strongbow" (this name was also his father's in his time). 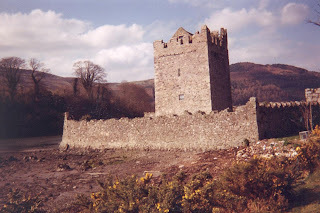 - from Waterford to Dublin and beyond, see Norman roots at France Road Ways, Normandy, Normans; and the Strongbow and Norman invasion at http://www.castlewales.com/is_clare.html/. 2. King Henry of England. Henry had rejected Strongbow's claims to certain lands, for reasons not entirely clear; but then the King became concerned at the successes of Strongbow and the Anglo-Normans in garnering support. Henry had to reassert control, and opportunities arose. Dermot of Ireland had come to Henry II for help in regaining his Leinster lands and throne, and Henry gave Dermot a writing declaring that all who supported Henry were released, if they chose, to support Dermot. And many did, including Strongbow who saw a chance to regain his former glory another way, see http://www.castlewales.com/strngbow.html. If the Pope gave permission for invasion, whether or not he had authority to do so, and for ecclesiastical ends (this being the era of Gregorian Reforms 1100 and on), and if the King pays handsomely for it, then the Pope wins by gaining clerical control over an unruly Christian non-Roman island; and the King Henry wins by getting his people in Ireland. Enter Strongbow and the Welsh lords invading in earnest, paying the Pope, the King in Ireland who lost his lands (Dermot) got them back, wed his daughter to Strongbow as promised, and maneuvered the throne to Strongbow upon Dermot's death, as promised, and the Pope got an ongoing payment of so much per head. Nice. See http://www.fordham.edu/halsall/source/geraldwales1.asp The Norman strain apparently was feisty, requiring such controls - the King had to be Somebody. 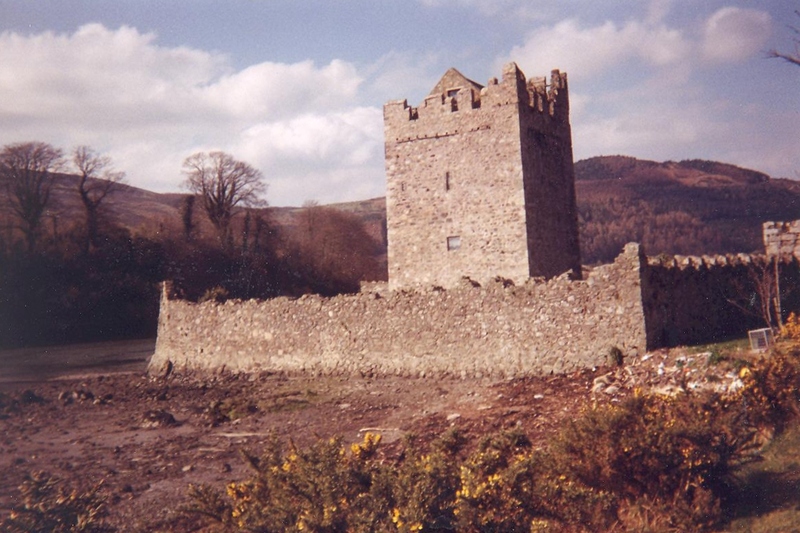 A trip to Ireland - see the number of Norman towers along the coasts, inland, even Yeats' home at Gort is a Norman tower house. Return and then find out the time sequence, the stresses, the conflicts. So some surnames of Norse derivation may not have arrived with Vikings going a-Viking, or settling thereafter, but could have come from another direction: with William the Conqueror in Normandy invading England, and the Normans then in time invading Ireland with Strongbow and others, Many Normans also settled in Wales. This is like a paperless filing cabinet, putting in bits that we may want to follow up later. This is our Web Dig, to find the origins and attributes of Queen Scotia, Scota, Sgota. There is a grave with that identification-indications of name, as she was buried in antiquity and with Egyptian hieroglyphs, they say, as befits the Pharaoh's daughter that she (some say) was. This grave of Scota is near Tralee, at the Slieve Mish Mountains, the range in the central area at the beginning of the Dingle Peninsula, western Ireland. Our interest then moves to other sources supporting the idea of this lady and her people peopling Ireland, at Plain Meaning, Origin Stories. 1. Folk-source summary. For a quick look at a folk-literature summary of the Scots connection, and information at those sites, see Caledonia, Queen Scotia, and Scotland. Queen Scotia's husband had been killed while fighting Ireland's famed Tuatha de Danaan; and Scotia, a warrior herself, led the troops against the Tuatha-de herself, with her sons, and prevailed. See her as a figurehead on a 19th Century Scots brig that was shipwrecked off Cornwall, The Caledonia. No wild woman, that. See www.panoramio.com. We want to know Scota's origins, her place in prehistory. She and her husband and their group fought (both were warriors) the old Tuatha de Danaan, here the Pantheon site, of prehistory. As an individual Queen: We want to know her accomplishments. There are numerous tales, with variations, and we track some of those. What commonalities. If that is all there is, why do we find references to her and her Milesian people, that tie her people from ancient Palestine and the Old Testament (yes!) and a tribe of Hebrews (not "Jews" at that time) who migrated through Egypt (perhaps) to Spain (Iberia - Eber- Hebrew) and from there to Ireland, Hibernia. The "Scotti" of Ireland (roots of Scotia?) went to Scotland, gave it their name, and the groups went back and forth for millennia. Sources for ancient migration evidence or belief include: "The histories of England, Wales, and Scotland, even Ireland also, were intertwined in ancient times such that the whole British Isles, due to the proximity of the islands, then shared a common British history, with common elements in the population of the islands, until the time of the Roman conquest of a large part of Britain ...." See the account at The British Chronicles Book 1, by David Hughes, 2007 / at page 43. As to Picts: " ...Credne is remembered in Irish tradition as the leader of the migration of the majority of the Irish Picts from Ireland to Scotland (emphasis added) during the Gaelic Conquest of Ireland, whence their name." See page 46. See portions at the google book there. So, were Picts in Ireland first (having come from the Orkneys and Hebrides or some such earlier) and did they fight Scota's group as Scota & Co. invaded; and then the pressured Picts headed (some) to Scotland; and then so did the Scotti or Scotii; and who was the Tuatha de Danaan that we understand that Scotia and group fought. The Picts? What support is there for a migration route from the eastern Mediterranean to Ireland through Spain, including "evidence" like place names, and were they one of the Hebrew tribes; or counted instead (or in addition) from descendants of (here goes) Noah. This gets to be a rabbit hole. A medieval source, Nennius 8th Century (look up Medieval Sourcebook), ties in groups from Spain to Ireland, and matches the moving groups with Old Testament timing - see FN 1 (open source). 2, For those of us new to this, it is confusing. Who? Which? Either? If the stories are irreconcilable, fine. Look at place names for history. Making sense of markers is ongoing - Look at geography, The Isle of Man, between the Irish Sea and Solway Firth, Scotland, and north England, would be a natural stop-off for people going back and forth from Europe, and even arriving. There is a small wiry dark group there, with legends about them having Spanish origins, see http://www.isle-of-man.com/manxnotebook/fulltext/pn1925/rn.htm/ Find there Spanish origins, and even Middle Eastern before that. Of course, dating of legends is difficult. Was this reference merely the Spanish Armada shipwrecking in 1588? Scroll down to Kione Spainey, or Spanish Head - Spain was once visible from this spot, so it says. If nothing is determinable beyond reasonable doubt, it is interesting, and we lay out what we have found here. We did find a discussion page with long dissertations on the tribes at http://www.flickr.com/photos/celtico/2924466222/ and a map of Irish Celtic tribes. Is Celtic different from the differing migrations we read about? Is Scotia considered Celtic? How could that be? That site also finds, at a post by a mysteryinternetchatsource (like us) "mikescottnz", two Scotias, each with a different history-connection to Ireland. Hello? Mike Scott in New Zealand, is that you? What did we get wrong? Scota Two: From early Irish chronicle, the Lebor Gabala (Book of Invasions, Book of Conqests). Scota is an Egytian princess, daughter of Cingris (name only in legend). Princess Scota. She married Niul, a son of Fenius Farsaid who was a Babylonian who traveled to Scythia after the Tower of Babel collapsed (more Christian glosses? ).Niul was a "linguistic scholar" and the Pharaoh invited him and gave him Scota to marry. They had the son, Goidal Glas, who did the Irish language. The Israelites leave Egypt, and so must Goidal. His descendants settle in Iberia, where Mil Espaine was born. Two of his sons, Eber Finn and Eremon settle Ireland. Is Zahar's line a lost tribe of Israel, and is this their story. Great fun. The traditional name for the grave area, a diminutive "Little Flower" is shown by the name of the area of the alleged gravesite, near Tralee, at Glen Scoithin (the Flower part) or Foley's Glen. To some, the Scoithin argues for her Gaelic origins, Scoithin as a synonym for traditional women's Gaelic names, Flora or Rosa. To others, the Scoithin ties with the Scythian woman, as she is also known. Wikipedia at Scotia's Grave adds that Scoithin information, that we had not had before. There is also the Red Hand of Ulster, that we looked at in American politics -- the use of the red hand in political advertising, to rally political supporters. See Red Hand, "Family", JPMorgan Chase, Code. Scroll down to the Ulster section. A modern exploitation of the red hand, a diminution of a core symbol for Ireland, with its pros and cons, uses in violence. A trivializing of The Red Hand to use it in America. Ui Niall was a Milesian, as was Scotia. If the Milesians were Hebrew by extraction, then the red hand has a double meaning - Ulster and the Old Testament. And if it became unfashionable as centuries passed, to be known as Hebrews, then the red hand idea could move easily from Story 1, about the birth of Zahar and his descendants wandering; to Story 2, update when Ui Niall hacks his off and hurls it to the beach in time to claim the Ulster coast. But if Ui Niall himself is a descendant of the wandering tribe, we are back at square one, and happily so. 13. Long after this, the Scots arrived in Ireland from Spain (emphasis added) The first that came was Partholomus, with a thousand men and women, these increased to four thousand; but a mortality coming suddenly upon them, they all perished in one week. The second was Nimech, the son of …..who, according to report, after having his ships shattered, arrived at a port in Ireland, and continuing there several years, returned at length with his followers to Spain. After these came three sons of a Spanish soldier with thirty ships, each of which contained thirty wives; and having remained there during the space of a year, there appeared to them, in the middle of the sea, a tower of glass, the summit of which seemed covered with men, to whom they often spoke, but received no answer. At length they determined to besiege the tower; and after a year's preparation, advanced towards it, with the whole number of their ships, and all the women, one ship only excepted, which had been wrecked, and in which were thirty men, and as many women; but when all had disembarked on the shore which surrounded the tower, the sea opened and swallowed them up. Ireland, however, was peopled, to the present period, from the family remaining in the vessel which was wrecked. Afterwards, others came from Spain, and possessed themselves of various parts of Britain. Death by Greed. A kind of genocide for its day. By way of update, the myth that the deaths were caused by the potato blight, the "gorta mor" or great hunger resulting, continues. See Archeology Magazine, American Institute of Archeology, Jan-Feb 2013 at http://www.archaeology.org/issues/. At the World Roundup Section at page 22, not delineated at the issue site, is reference to Ireland on the map. The deaths of some 1.5 million people is attributed to the Phytophthora Infestans microorganism causing potato blight. An exhibit at Quinnipiac University, Hamden CT, shows art related to the era -- to be visited to see what causation they trace to the real cause of death. Failure to distribute food, not unavailability of food. But there was plenty of other food in Ireland, all owned by distant landowners, or local landowners keeping their distance from the locals, and profit-driven. See http://rootsweb.com/%7Eirlkik/ihm/ire1841.htm. The BBC gives information on whether the famine in Ireland was preventable - food available, but deflected by the powers to England or other places, not to the locals. See also http://www.bbc.co.uk/history/british/victorians/famine_07.shtml. Skibbereen, a town in the southeast corner of Ireland, was decimated. This is Skibbereen. It was a focal point of the 1840's famine years, and built an extensive memorial. 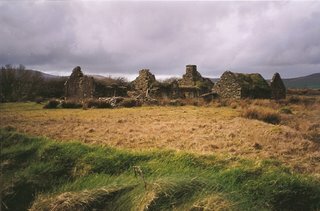 See http://www.skibbheritage.com/famine.htm. A personalized view of the famine is at http://www.eyewitnesstohistory.com/irishfamine. This site offers first-hand accounts, by people at the time. It is hard to know whether a particular ruin is related to the famine. Perhaps this farm was just abandoned with changing property lines. But empty homes and farms haunt fields and towns everywhere.